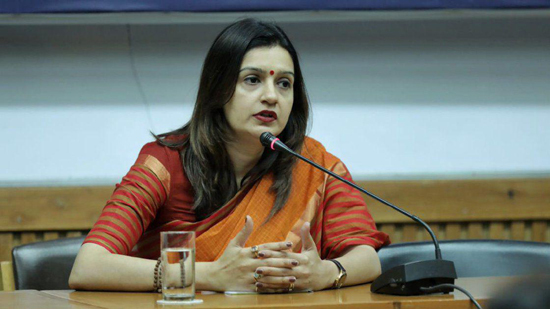 VARANASI: National spokesman Priyanka Chaturvedi, Congress has claimed “the impact of Bharat Bandh ‘in Varanasi. He said that the participation of every section in the bandh proved that the people are very angry with their MP and Prime Minister Narendra Modi and have made the mind of showing them the way out of power. The Congress spokesman, who is moaning from the country’s public with inflation and unemployment , said that people of the country are moaning with inflation and unemployment in the last four-and-a-half years of Modi’s tenure as Prime Minister by promising to bring ‘good days’. He accused the Rafale deal of corruption of thousands of rupees in the deal, saying, ‘Do not eat or you will not eat’ Modi’s resolution proved to be a test like other promises. He said that the government has earned the profits from inflation and said that despite the price of crude oil in the international market, the price of petroleum products like diesel, petrol and LPG was not lowered and the increase was being done during the Modi government . With the increase in the prices of petroleum products, the government has made a profit of Rs 11 lakh crore by putting the burden of inflation and its use is now spent on illegitimate advertisements. The government does not care about the problems of the public. He said that due to the constant increase in prices of petrol and diesel prices of daily use are skyrocketing. LPG prices have doubled, with the poor and middle class domestic budget deteriorating, but the government does not care about the problems of the public. They turned their backs on their accountability.